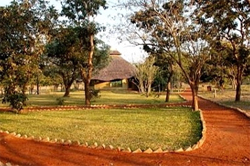 Gorongosa Park hotels, accommodation and places to stay. Guide to where to visit and where to stay in Gorongosa Park Mozambique. Information on Gorongosa Park Mozambique, location of hotels, lodges, camp sites, guest houses, bed and breakfasts and places to stay in the Gorongosa Park area of Mozambique. Distances from major attractions to Gorongosa Park and information about shops, fuel and facilities. Gorongosa National Park is located north of Beira in a beautiful remote area with Mount Gorongosa, a 1,800-metre high massif whose rivers and streams sustain the park’s wildlife guarding the park. There are guided trails up Mount Gorongosa where you will see many different kinds of forest and rare plants, wonderful birdlife, gorgeous waterfalls and the view from the top is breathtaking ! Gorongosa National Park is approx 3,770 square kilometres of savannah, woodlands, and rainforest in central Mozambique, Southern Africa. The greater Gorongosa region is ecologically unique situated at the southern most end of the Great African Rift Valley; as a result it is a region with high species diversity and environmental features found nowhere else in the sub-continent. The key to continued biodiversity and habitat preservation on the planet is to protect areas of ecological importance, such as the Gorongosa National Park and the surrounding water catchments, such as is found on nearby Mount Gorongosa. Chitengo Safari Camp is open for visitors, birding walks, hotel and camping accommodations, restaurant meals and swimming. Available activities include trips to Mount Gorongosa, community visits, walks at the Community Education Center and the Bué Maria lookout. Come and enjoy the Gorongosa National Park in its lush splendor and you will be directly participating in one of the greatest restoration projects in Southern Africa and see firsthand how rapidly and positively nature responds when given a bit of help and space from mankind. The initial camp in Chitengo was constructed in 1941 and hosted thousands of visitors from all over the world until 1981, when Mozambique’s civil war shut it down. It was mostly destroyed during the war, but re-opened in 1995. 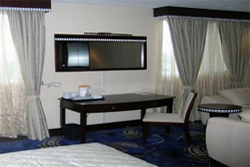 We are now restoring and rebuilding it with many modern conveniences. 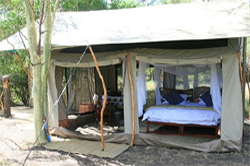 ‘Explore Gorongosa’ is a private ecotourism outfit which runs exclusive luxury walking safaris based out of the comforts of a luxurious custom-designed tented camp. These intimate, personal mobile safari experiences led by expert guides cater for a maximum of eight guests and provide the ultimate in safari service and personal comforts. There are lions, elephants, buffalos, and many kinds of antelope, with frequent sightings of sable, impala, oribi, bushbuck, reedbuck, kudu, nyala, waterbuck, and (less frequently) zebra, hartebeest and eland. On night drives, you can see porcupines, genets, civets and servals. Lake Urema and its waterways support healthy populations of crocodiles and hippos. The park’s birdlife is fantastic! About 400 species have been sighted in recent years. Many are endemics or near-endemics prized by birders. The Green-headed Oriole, for example, is found in southern Africa only on Mount Gorongosa, and the Moustached Warbler has been sighted at Chitengo safari camp and on Gorongosa mountain. Gorongosa National Park is mostly wilderness surrounded by rural areas with only a few small, scattered villages, so remember to bring supplies with you ! Gorongosa National Park does not sell fuel. The closest reliable stations are in Beira, Dondo, Nhamatanda, Chimoio and Caia. The Carr Foundation, a U.S. not-for-profit organization, has teamed with the Government of Mozambique to protect and restore the ecosystem of Gorongosa National Park and to develop an ecotourism industry to benefit local communities. In January, 2008, the Foundation signed a 20-year contract with the Government to co-manage the Park. This long-term commitment to work together followed a 3½ year period of restoration activities that were conducted under an initial Memorandum of Understanding. There is a variety of activities availabel from Chitengo including wildlife game drives, birding safaris, and community walks guided by local experts on the Park’s flora and fauna. Drive out across the miombo to look for lions, elephants, and antelope. Or walk to a nearby community to visit the new school and health clinic that was recently built.